Hawkeye was one of my favorite characters in the movie because he didn't have superpowers. Very cool persona. I like that all those super persons have an ordinary human keep up with them :) and it helps that the actor is easy on the eye. I think that's the only way there could ever be a Hawkeye movie - Black Widow would have to be in it with him. I wasn't at all sure about Renner as Hawkeye when the casting was announced, but I think he nailed it. 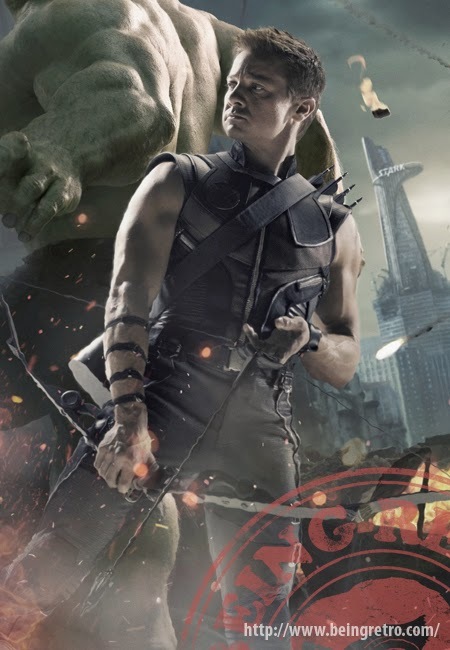 Love Renner as Hawkeye. He makes me want to practice my bow skills. Can't wait to see him again in Age of Ultron! Hawkeye is cool. He's not one of my favorite Avengers, but he still has mad skills for a human, lol. I think it's important to be able to connect with the characters in a story, even the super heroes. While we may never have their abilities, they still need to be real to us. I may have to check out that movie. Haven't heard much about it. Love Jeremy Renner and he ruled as Hawkeye--why they ever cancelled The Unusuals I will never understand! what an actor and so humble! I like Hawkeye but he and BW aren't big enough to have their own movies. I know, I've said it before, but they are great side characters. Did you catch the line in Big Bang about Hawkeye?